The special event was a celebration to thank the dedicated community volunteers who give their time working on biodiversity and habitat restoration, those caring for and rescuing wildlife, and the experts helping Council implement wildlife strategies. 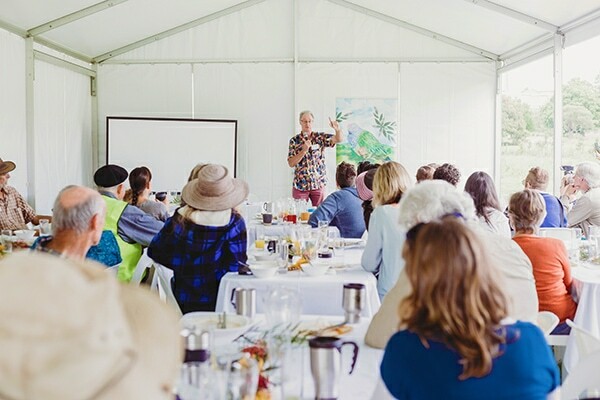 In total 16 community groups were represented at the breakfast including Landcare volunteers, Friends of the Koala members, wildlife carers and the Koala Plan of Management Implementation Group. Special guest Professor Daryl Jones from Griffith University, an expert on road ecology, inspired the gathered guests – starting with a statement on the power of well-organised community groups to influence government. He shared research and statistics from the Netherlands and France on the increasing use of wildlife overpasses and how important they are for Australian animals which “are on the move” due to climate change. “Every big road in the world (more than two lanes) is a complete barrier to little birds and stop them from crossing, not due to traffic but the lack of vegetation or cover,” Daryl said. He said Australia has only six wildlife crossings across the country (one under construction) – three in Brisbane city and three in Northern NSW. In contrast, the Netherlands has 68 while France has 380. After the breakfast guests went on a guided tour of the South Lismore Duck Pond Landcare site with members of the group to look at recent work on Leycester Creek, providing an example of the efforts of local volunteers to restore native habitats.